According to IQ, METALLICA played to 22,211 people at The O2 in London, England Tuesday night (October 24), breaking the previous record of 21,000 set by MUSE in 2016. The “in-the-round” staging of the heavy metal legends’ “WorldWired” tour — with METALLICA performing in the middle of the arena — expanded the seating capacity at the venue, which allowed the band to set the new record. 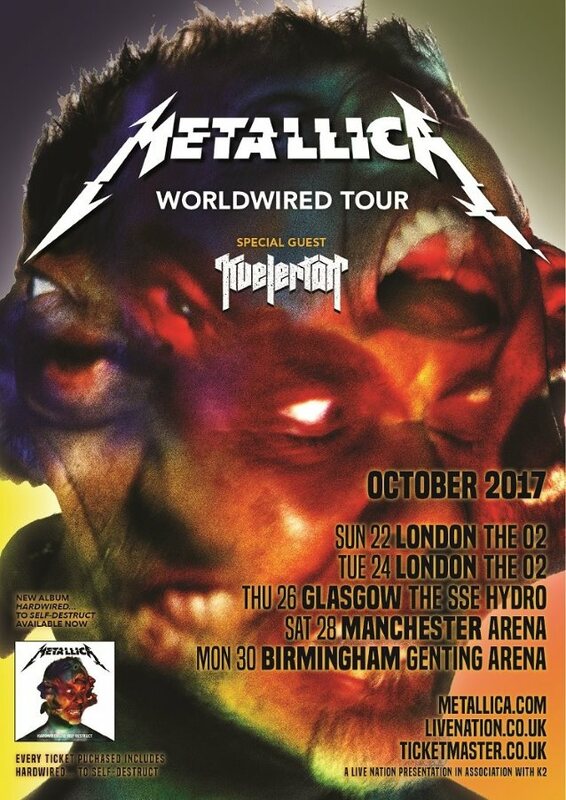 METALLICA‘s two shows at The O2 were part of the U.K. leg of the “WorldWired” tour, which will be at the SSE Hydro in Glasgow Thursday night (October 26). The O2’s head of programming, Christian D’Acuna, presented the members of METALLICA with an illustration specially commissioned to mark their achievement. The artwork was inspired by and the iconic design of the London venue and included the band’s creative input. Christian said: “METALLICA smashed the highest attendance record during both of their shows at The O2. It was an honour to host the heavy metal rock gods at the venue and they did not disappoint, delivering an incredible show in the round, full of hits spanning their whole career. Metallica played to over 22,000 people at The O2 last night.